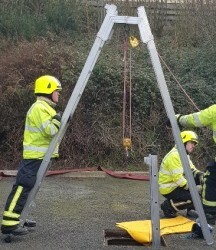 We supply a full range of Fire Service Ladders, and Height equipment constructed to a variety of approved European standards. 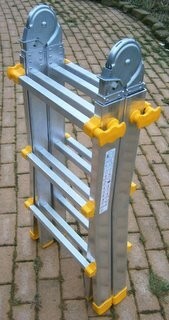 BSEN-1147-2010 Ladders for Fire Service use. We offer a full range of Fire Service ladders and platforms that are compatible with all user requirements, procedures & stowage, constructed to BS EN-1147-2010 standards. 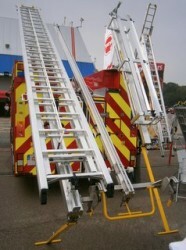 Features of our: BSEN-1147-2010 Fire Service Ladders. Life: Expectancy: 25 Year Minimum, can be extended indefinitely. Stowage: Comparable with all existing stowage arrangements. Drills: No changes to normal operational drills. 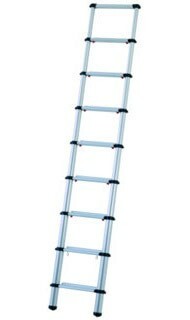 Usage: Safe firm ladder, creates a safer working area. Weight: Lighter than all other equivelent sized types. Strength: Very high strength to weight ratio. Maintenance: The Easiest and simplest to work on. Spare Parts: Readily available, and well priced creating the "Best Value"
Prices: Lowest initial cost, making the very best "Whole life cost". Our ladders and other height equipment are manufactured in Austria by our European partners JUST Leitern, having over 130 years experience manufacturing ladders and working at height equipment. We have designed an attachemnet that fits onto existing short extension ladders converting them into a Lifting A frame capble of lifting 300KG at various heights. 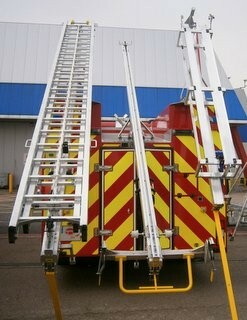 EN-1147 European Fire Service ladders. 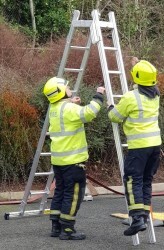 ONORM F4047 Fire Service Ladders. EN131: Class 1 Heavy Industrial. EN131: Class 2 Light Industrial/Trade. ONORM Various European Industrial standards. 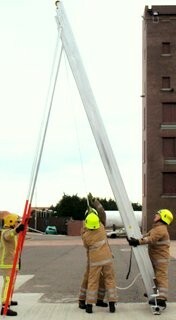 EN ISO 14122 Vertical Ladders. ONORM B 4007 Scaffolds & Towers. Our Automated welding plant, for ladder assembly. 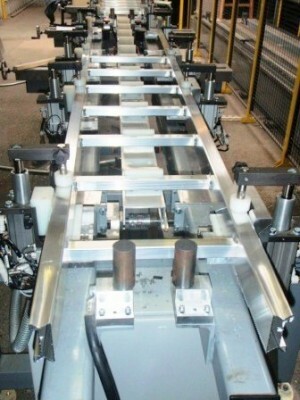 The sections are assembled on the plant and auto checked for size and accuracy. The rungs: are fitted through the stile sections and touching the outer edge, therfore the weight is resting on the section. When all is OK, all sections are Auto welded. 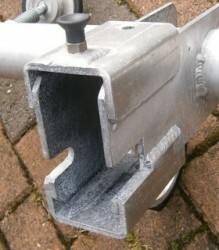 Other attachments and fittings are then secured onto the ladder before quality testing. This creates a very strong ladder and reduces assembly costs. The roller channel is part of the stile section, which also strengthens the ladder. 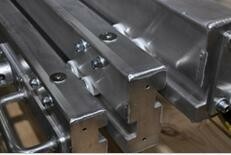 All fittings and bolts are of Stainless Steel, to ensure the complete ladder will stand the test of time. All our large profile ladder can be fitted with a standard Jack-beam or a Removable Jack-beam, the removable Jack-beam is removed and refitted in moments without any tools or equipment. 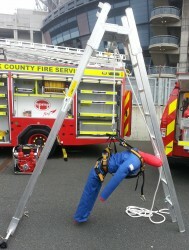 This allows for the ladder to be used with or without jack-beam; when the need arises and when safe to do so. Total Care:- Quarterly inspections, Annual test and maintenance cover. Part Care:- Annual test and maintenance cover. Maintenance Only:- Maintenance cover when required. Full details of any Care and Maintenance package can be found in the Support Section, or call for any additional information. 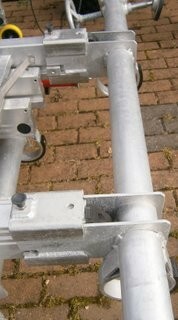 We can quote for any type of ladder maintenance, testing, inspection on clients own premises. 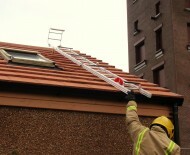 Operational Use (Fire Brigade Ladders). Contact us for full details on all our range or services.